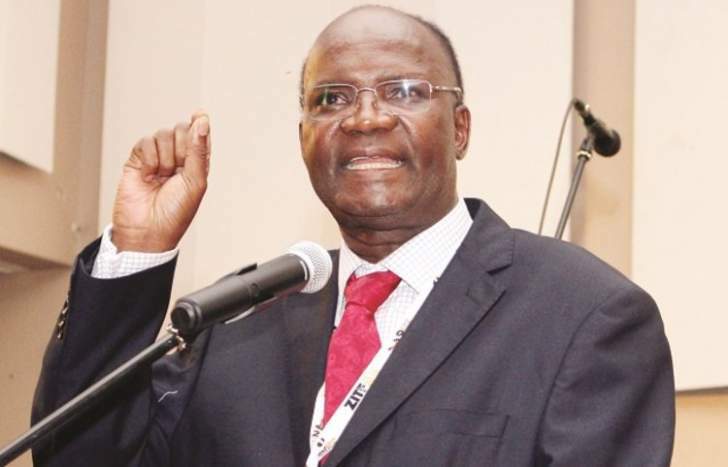 Exiled former ZANU PF minister Professor Jonathan Moyo has told Strive Masiyiwa and his lawyer Tawanda Nyambirai to go to hell as he is not afraid of them. Moyo said he is willing to face Masiyiwa and his team pound for pound if there continued to vilify him. Moyo was responding to reports that Masiyiwa had instructed lawyers to serve him for defamation. On Thursday Moyo continued to expose Masiyiwa's role in ZANU PF behind the scenes and identify him as one of the key players in keeping ZANU PF in power. It's trite that the process to renew a mobile phone operator's license must be as prescribed by law. It can't be an open process subject to negotiation between the operator the regulator as happened with Econet and ZanuPF when the latter needed 2013 election funds for ZEC! Before detailing how and why the renewal of Econet's license in 2013 was unorthodox and illegal, as it was specifically tied to the mobilisation of funds to run the 2013 elections, I need to first tell Strive Masiyiwa and his running dogs such as Tawanda Nyambirai to go to hell! Strive Masiyiwa initiated this debate when he made false and defamatory allegations on his Facebook page that I "organised farm invasions, theft of elections and violence against the opposition". I responded by disclosing his role through Econet in rigged polls in 2008 and 2013! As advised by my lawyers, I could have responded by suing Masiyiwa in Britain, a right I have reserved, but in the interest of truth-telling I used my Twitter TL to disclose what I know about his dirty deals with ZanuPF as he faked to be 100% with the MDC in 2008 and 2013! Strive Masiyiwa's use of ZanuPF's Varakashi to peddle litigation threats after he initiated the debate with false and defamatory allegations against me on his FACEBOOK page confirms he's working with ZanuPF and is a coward and a cyber bully who starts debates he cannot finish! Only a bondnote billionaire like Masiyiwa has time to start cyber brawls to defame users of his company products. Imagine billionaires like Bill Gates or Mark Zuckerberg doing that. If Masiyiwa and his running dogs want a rumble in the dungeon, they'll get it pound for pound! Now to Masiyiwa's ZanuPF dirty deal to fund the organisation and conduct of the 2013 elections by ZEC. In February 2013 as I was researching and drafting the ZanuPF 2013 election manifesto, Patrick Chinamasa engaged me on a need for a select group to solve election problems! Chinamasa told me that there had been a core group in 2008 to deal with the runoff; which included Mnangagwa, Chiwenga, Chihuri, Bonyongwe, Charamba, Gono, himself and others he did not name. He said this group formalised dollarisation and introduced multicurrency in Jan 2009! Chinamasa said he had sought and obtained approval from President Mugabe to revive the 2008 group to prepare for the 2013 poll. He asked for new names to add to the 2013 group, besides mine. I suggested Rtd Brig General Tapfumaneyi from ZanuPF HQ and Kizito Gweshe from the CIO. The full 2013 poll group had: Emmerson Mnangagwa (who chaired it), Dr Sydney Sekeramayi, Patrick Chinamasa (deputy chair), Nicholas Goche, Gen Constantino Chiwenga, Augustine Chihuri, Happyton Bonyongwe, Walter Tapfumaneyi, Kizito Gweshe, George Charamba and Jonathan Moyo! 1. Contain Sadc mediation, so it does not derail 2013 elections. 2. Ensure that Parliament is dissolved by 29 June 2013 and elections are held soon thereafter. 3. Get Econet and diamond companies to fund elections to avoid UN funding! Besides the three-pronged agenda, there were other daily issues that cropped up. One was a report that lawyer Beatrice Mtetwa had blocked a police raid on Prime Minister Tsvangirai's Bath Rd offices in Belgravia. The group decided to have Mtetwa deported but this failed! A double-edged strategy was adopted to end Sadc mediation and ensure the election is held soon after the dissolution of Parliament on 29 June 2013: take the disputed election date to the Supreme Court and out of the hands of Sadc who wanted GPA parties to negotiate the date! By the time Sadc held its Maputo Summit on 15 June 2013, the Supreme Court had ordered President Mugabe to issue a proclamation to hold elections by 31 July 2013 in the famous Mawarire judgment. A poll date had been set. Sadc could not interfere with a court decision! Bouyed by its Supreme Court strategy to end Sadc mediation and to set a date for the 2013 election outside GPA negotiations, the group got Prof Lovemore Madhuku to fly with President Mugabe to Maputo for the 15 June 2013 Sadc Summit to explain the Supreme Court decision! Linked to the Supreme Court strategy to end Sadc mediation and to set 31 July 2013 as the election date, was the need to mobilise funds for ZEC to organize and conduct the election. Since Treasury had said there was no money for elections, the UN had stepped in with an offer! The group had problems with the UN offer to fund ZEC for the 2013 elections. The UN offer came with a litany of conditions: insisting on an advance team to assess the situation on the ground; on the management of the elections; and on election observers. Tough conditions! The group rejected the UN offer because of its politically tough conditions. This drove the group to find alternative sources of funding. Two were identified: negotiating with diamond companies in Chiadzwa and negotiating with Econet, whose license was expiring July 2013! The negotiations with Mbada, Anjin and Marange Diamonds were straightforward but by then the murmurs were that alluvials had run out. Also, these diamond companies and the Army were busy importing ZanuPF election regalia. It's the negotiations with Econet which got tough! There have been comparisons between Econet in 2013 and ANZ, publishers of Masiyiwa's Nyarota edited DailyNews in 2003. The two are very different. In 2003 ANZ refused to register and approached the Supreme Court for condonation but failed. In 2013 Econet NEGOTIATED a DEAL! The illegality and rot over the Econet situation in 2013 starts with the fact that it's license renewal did not follow a transparent process as prescribed by law. Instead, it followed an open-ended "scratch-my-back-and-I-scatch-your-back" process between ZanuPF and Masiyiwa! ZanuPF knew that Econet's 15 year licence issued in July 1998 was due to expire in July 2013. ZanuPF WANTED A DEAL for Econet to pay $180m for a renewed license for a new 15 year period; which previously was $100m. The extra $80m would then underwrite the 2013 election! Masiyiwa knew ZanuPF was vulnerable and desperate to fund the 2013 poll and avoid the UN. Econet played tough: reduce $180m fee to $137,5m for 20 and not 15 years; deduct $60m interconnection fees owed to Econet by NetOne and TelOne; Econet to pay $77,5m over six months! ZanuPF got the money to stop UN funds for ZEC to run the 2013 poll with no UN conditions and no UN observers. Masiyiwa got Econet's license renewed for a song. Taxpayers paid $60m of the Econet license by assuming NetOne and TelOne debts to Econet. It was a MEGA DEAL!